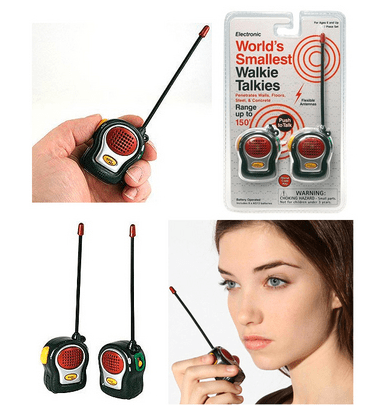 The World's Smallest Walkie Talkies are ideal for your little investigators. Kid-sized yet totally high-tech, these walkie talkies can be used to talk or to exchange morse code (instructions included), depending on just how secretive they want to be! With the power to penetrate walls, floors, steel, and even concrete, these kids walkie talkie radios have a range up to 150 feet. Antennas are flexible for pocket portability. Dimensions: 2" x 1 1/2"